My name is Jonathon, and for almost ten years now, I have been suffering from nerve pain due to a neck injury. After two neck surgeries and a metal plate at C4-C5, I still continued to have pain. Furthermore, as a result of the metal plate, my other discs have degenerated and have led to bulging discs at C3-C4 and C5-C8, causing even more pain and symptoms of neuropathy. Before meeting Dr. Michlin, no chiropractor would work on my neck. I went to several surgeons, including the top surgeons at Southwestern Medical Center in Dallas, and was told that I was beyond surgical intervention. Since working with Dr. Michlin, I have actually been experiencing pain relief for the first time in ten years. His expertise in cervical care and his precision in adjusting the spine have provided corrective care to the discs in my neck and back. Within the first few visits, I began to have feeling in my arms and legs which had been numb for years. My treatment is ongoing, but having hope again is as therapeutic as the actual care I receive. 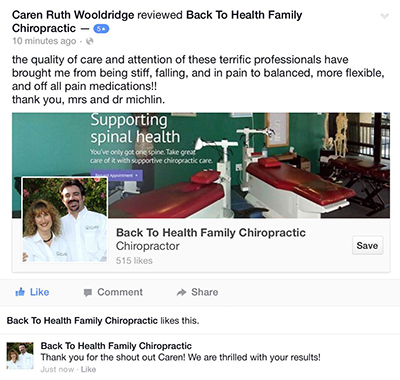 I would recommend Dr. Michlin to anyone who is experiencing neck or back pain. He is truly qualified to treat the entire spine, and he is specialized to deal with situations where other doctors have given up. After four adjustments, a patient suffering from post chemotherapy neuropathy wrote to me Sunday morning to say, "This morning I wept with joy. It has been longer than I can remember that I was able to stand straight up from taking a bath!! I am sure Dr. Michlin is used to folks being grateful to him for what he does. I must tell say, y'all are changing my life (medically and spiritually)!!"